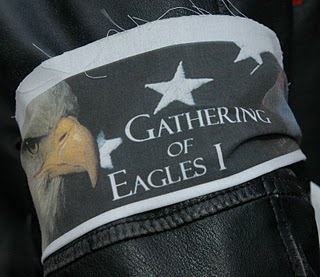 The Gathering of Eagles formed because of the incidents that happened in Washington, DC, on January 27, 2007. On that day the ‘peace’ protesters held a march to the Capitol. Along the way they defaced the Navy Memorial, spit on an Iraq Veteran amputee, and spray painted their slogans on the Capitol steps. The Washington, DC, and Capitol Police did nothing. Yes, there were many prior incidents, but this one was the catalyst. When they announced that their next demonstration (a march on the pentagon) would begin with a rally at the Vietnam War Memorial on March 17, 2007, that was too much for many Vietnam Veterans to bear. The Vietnam Veterans had the most experience with this type of radical activism slandering and defaming them. The overwhelming majority of them had served honorably and well in Vietnam, yet were branded ‘baby killers’ when they came home. Those men and women were appalled that another generation of American soldiers was being put through the same treatment they received. They were incensed that the police refused to maintain order in January. They were infuriated that their memorial, which honored 58,000 of their brothers and sisters who never made it home, could be defaced. When it was announced that Jane Fonda was going to be present that was the icing on the cake. In the intervening years from the sixties and seventies a technological revolution had swept the U.S. and the world. Where before such individuals would have stewed by themselves and punched their TVs or yelled at their radios, now they actually had a means of finding and communicating with others who felt the same way. Internet groups and blogs had appeared on the scene which allowed interactive communications. Many of the veterans groups had established such forums and the combination of factors that I cited above lit up the channels like a brushfire on the prairie. Non-military groups and individuals picked up on the chatter and passed the information along to their readers. Eventually almost every website that supported the troops and that was at all current on events had a reference to the March 17th date. There was a general consensus that the time had come to act. That the ‘see no evil’ attitude of the police was going to encourage worse acts of violence and desecration than had taken place yet. That we had to sacrifice to protect our memorials and our men and women who served in Iraq and Afghanistan from the lunacy at home. So we came. In ones and twos, a group here, an individual there. In weather that was atrocious if not life threatening. Braving a blizzard that blanketed the northeast, many drove through the dark night to be there. No one knew how many would arrive, few had posted their intentions on the web, but still they came. When dawn broke in Washington on March 17th, a coating of ice covered the ground as veterans and patriots alike began to gather on the mall. A stiff icy wind blew across the Potomac, but it failed to chill our resolve. Like buds flowering in the spring, flags began to sprout on the grounds of the rally site, all around the Vietnam Memorial and on the grounds of the Lincoln Monument. It was a moment like none of us had ever witnessed, thousands had come from all across the country to stand guard over our memorials and prevent the excesses of the anarchists. The ‘peace’ groups rallied directly across from the Lincoln Monument and for several hours we had to listen to their ranting and raving about the ‘evil’ United States, and how ‘peaceful’ the enemy is. The profanity they used and the hatred they exuded for this country was palpable to anyone within a quarter mile. Witnessing them in action was all the validation any of us needed for our determination and sacrifice in getting there. For most of us it was a ‘Never Again’ moment. A resolve was reached that never again would we allow these people to go unopposed in their attempts to gain political advantage by flagrant acts of violence, desecration and abuse. Never again would we allow such people to do unto our veterans today what they were able to do to our veterans in the past. Never again would one generation of veterans abandon another. Here is some background and a recap of the event. Follow the report through all four parts!